NICHELLE: I know my chances of finding work in the comic industry are incredibly small. I know I’d be better off studying law or business or—or “meta-liturgical engineering.” But I have to try. You’ve got the best job in the world. You get to bring superheroes to life! A.K.A. Fangirl is a comedy about comics, cosplay, and social catastrophes. 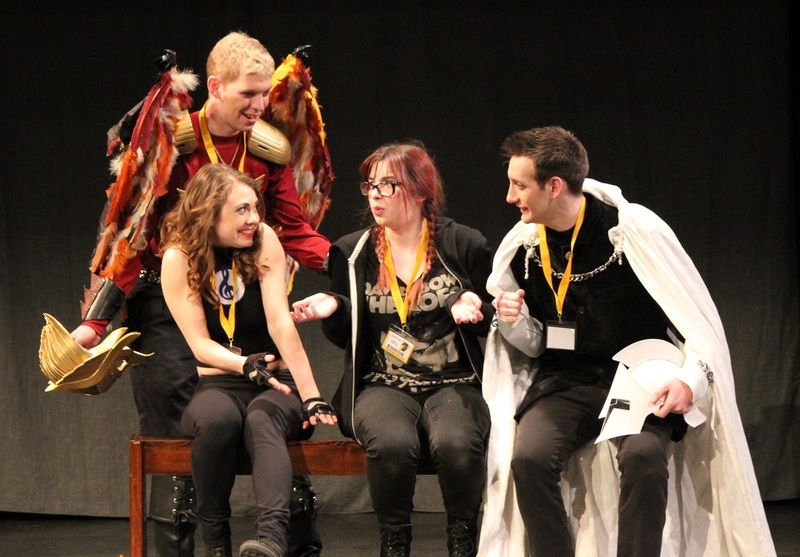 The play focuses on Nichelle O'Neil, high school student and aspiring comic book creator, and her experiences at Fanaconda Fest, a science fiction convention. As the play begins, Nichelle has just gotten into an apocalyptic fight with her best friend, Cassie, the person who was going to accompany her to Fanaconda Fest. Although she is feeling alone and betrayed, Nichelle decides to attend the convention by herself in the hope of meeting her idol, the reclusive comic book auteur Miriam Parker-Wood. Throughout the play, Nichelle's story is juxtaposed with the adventures of the Midnight Sentinels, the superhero protagonists of the graphic novel she is writing. Poster designed by Okanagan College Writing and Publishing student Aleksina Teto. Okanagan theatre-goers have a chance to see the inaugural presentation of an award-winning play, when Okanagan College’s Red Dot Players present A.K.A. Fangirl, a play written by Jeremy Beaulne, an OC English professor and playwright. The play will run from March 10 to March 13 at the College’s Kelowna campus in the campus theatre. The play is being directed by Beaulne, and focuses on the life of Nichelle O’Neil, a high-school student and aspiring comic book creator. During her adventures at a comic book convention, her world is juxtaposed with the exploits of the superhero characters she created for a graphic novel she is writing. A.K.A. Fangirl won “Best Full-Length Play” in Theatre BC’s 2014 playwriting competition. Tickets for the production are $15 for adults, and $12 for students and seniors. They are available for cash only at Leo’s Videos, Mosaic Books, the Okanagan College campus store, and at the door. Beaulne warns that the presentation includes coarse language, intense scenes, and flashing lights and that it may not be appropriate for younger audiences. Ashley Johnson, 18, plays the lead role. “I think the people who will enjoy this play are cosplayers and nerds of all sorts,” says Johnson. “You like Star Wars? Well, I'll give you a semi-mean line about Mark Hamill. You like cosplay and superheroes? We've got both! Who wouldn't want to hear about the adventures of a group of socially inept nerds who are able to get a very shielded nerd to open up to them and actually become friends?" Beyond Johnson, the cast includes Kevin Morrison as Jack/Dr. Nocturnus, Zoe Sommerfeld as Louise/Vibrato, Torsten Nogel as Bernie/Winged Fury, Ruby Bullock-Spitz as Miriam/Lupescu, Zoë Sehn as Allyson/Chimera, Harry Grossmith as Laurence, Amy Williams as Super Panda, Jeremy Ratt as the narrator/Lucas, Mike Boulter as a comic book fan, and Amy Wagner as another comic book fan. To listen to the story, click this button.